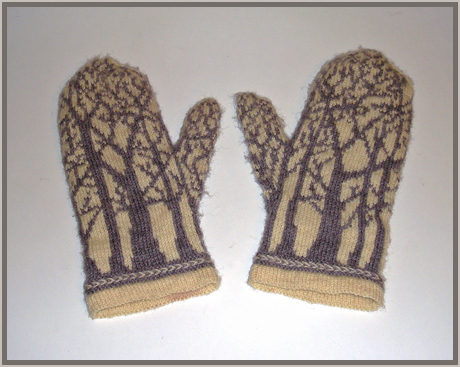 My Deep in the Forest mittens have been finished for about a week already, and my son has even taken them into daily use, as you can see from the picture below. I should have taken pictures before I gave them to him, but the weather has been lousy, and my possibilities to get any good outside pictures close to zero. And he needed them. This picture is taken inside, without any sun or anything that could brighten them up. I'll take new pictures as soon as the weather clears up! 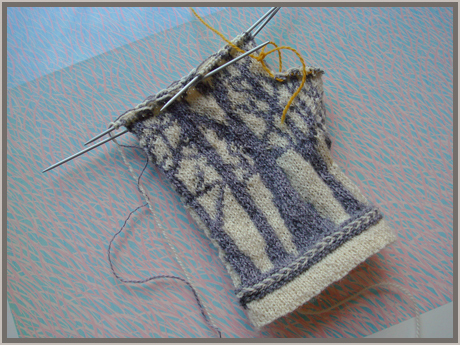 Summary of this mitten project: My gauge was totally off, but otherwise a very nice outcome. The pattern is very clear and well written, and I made few alterations. The major one was that I picked up thumb stitches from the contrast colour yarn in the previous row, not MC, and then I attached the cuff lining at the same time as I knitted the first grey row off the braid (simply pick up the cast-on row on a spare needle, and knit the cast-on stitch together with the live stitch you have on your ordinary needle). I like how the mittens look. 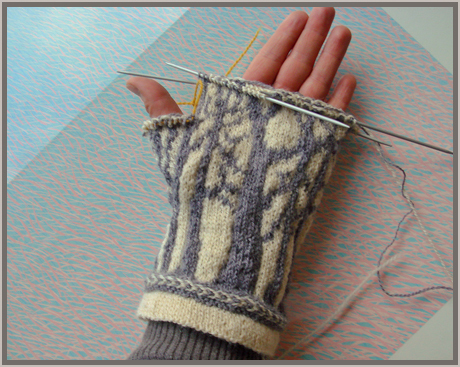 Pattern: Deep in the Forest mittens by Tuulia Salmela. Yarn: Vuorelmas Satakieli, 2ply 100 % wool in off white and grey (957). Modelled pictures as soon as the weather clear up! And P.S. : I have cast on two new pairs of mittens, and the first thing I will do next year is to make an order for yarns to several bigger projects ! Yes! But this year I try to finish the mittens and the Ribby cardi.